British influence on the three cities, as settlement, colony and treaty port, extended beyond politics and commerce. This chapter discusses the ways in which culinary relics remained long after the British left. 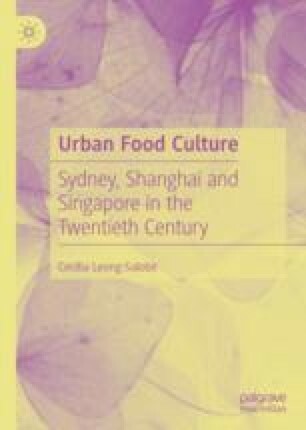 It investigates whether the kinds of political structures put in place had any bearing on the types of foods the British consumed in each territory. This chapter discusses the ways in which some culinary relics remained long after British rule, the most significant dish being curry. It engages with memoirs and other private records together with cookbooks to demonstrate if any of the colonial dishes survived through the postcolonial years of the twentieth century. It also looks at the ways some of these dishes have been further hybridized with local cuisines. http://www.australia.gov.au/about-australia/australian-story/austn-food-and-drink. Accessed 15 Nov 2017.